Last week, Kat and I attempted a photoshoot with the Les Méchantes dogs wearing our new line of dog apparel. While Benji on the left cooperated nicely, Oscar did not. Trying to get him to stand still and stay is just impossible. He has a mind of his own and would rather run and chase the seagulls! Of course it would have helped if I actually remembered the treats! Notice Oscar looking up for them? Yea, I forgot them. He is the perfect male model! Doesn't he look handsome in his bowtie? Oscar and Benji modeled the bowtie too. We found if we put them on the bench, they actually cooperated. Who wore the tie better? Off the bench, they were like herding cats--every which way! Who wore the harness better? I'm imagining Oscar whispering in Benji's ear that this is stupid! Who wore the coat better? 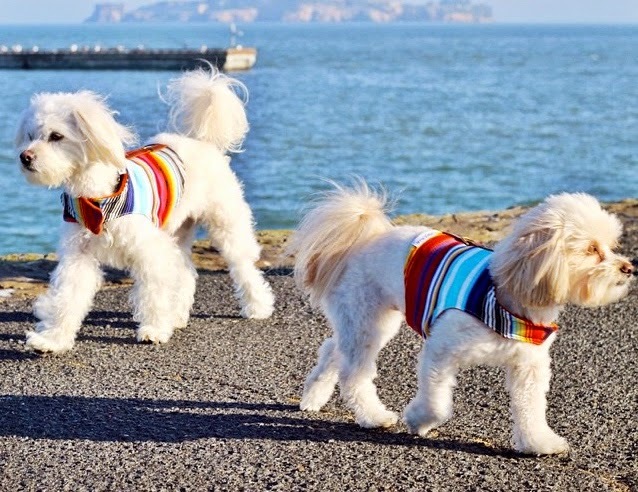 To see more dog clothes and accessories, be sure to visit Les Méchantes here. Use the code Dlo15 to receive a 15% discount off your purchase. What sweet dogs! Nice dog-wear as well! oh my gosh, they are too funny! What a handsome group of fellas! I loved this post. Oscar and Benji remind me of my two that have passed. A shih tzu and a mix. Very cute. Thanks for sharing. So much adorableness in one post ! The clothes are cute too ! OMG Delores that was the cutest post ever!!! Such cutie pies!!!! I think they were all good sports. You got some awesome shots. Bear is distinguished looking isn't he? I think all three are sweet and and love their bow ties.